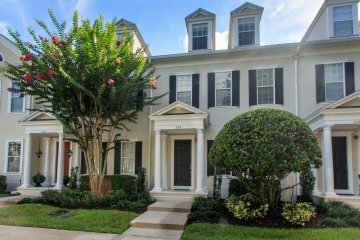 Beautiful townhome in Disney's charming village of Celebration - nestled in a quiet location and featuring 3 spacious bedrooms and 3 1/2 baths. An open floor plan boasts new wood flooring throughout, crown molding, a formal living room, dining room and Kitchen on the first level. A bright and light Kitchen features new stainless appliances, an abundance of storage, a writing desk and a half bath off the Kitchen area. French doors open to a screened Porch with lovely views of the conservation area. The courtyard is fenced. The second floor includes a Master Suite and 2nd bedroom with a laundry facility near the bedrooms.The Master Suite is spacious featuring a walk-in desk area/office, dual sinks in the adjoining master bathroom with a garden tub and walk-in shower. Bathrooms are newly renovated with quart countertops.New A/C units and new water heater in 2016. New roof in 2017, new double garage door opener in 2018. Concrete block construction. This is a rare opportunity in one of the best locations with gorgeous views - and very convenient to downtown Celebration amenities, parks, pools and events. Only 5 minutes to Disney entertainment parks and 15 minutes to Orlando International Airport. PRIME LOCATION !